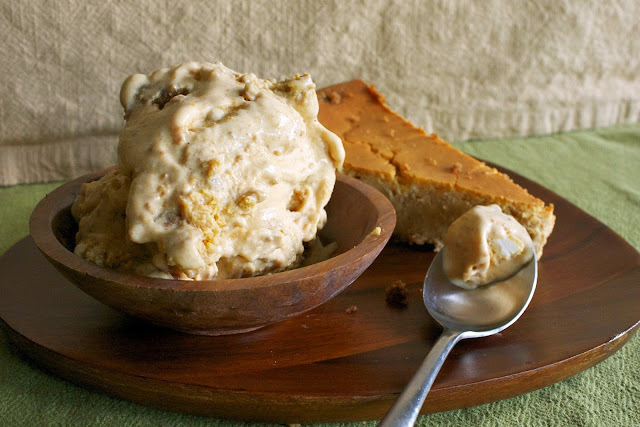 If you love lemons, this gelato is must try! 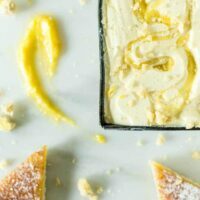 The Limoncello Gelato with Vanilla Lemon Curd Swirl is sweet, creamy and smooth with just a touch of that tart lemon sour that makes you want to dive in for another spoonful. 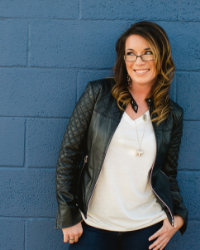 If there is one thing I can not walk away from in this world it’s tacos, bacon, cheeseburgers, a good steak, the last piece of dark chocolate, those little peanut butter stuffed pretzel bites, ice cream. When the sun starts to warm the days to a smoulder and the nights come a but later, all I want to do is settle in for a nice walk down to the corner store and get a soft serve with sprinkles. Our days get busy and the chores get in the way, but at least once a week throughout the summer, I make it an adventure to hunt out a new location of flavour. Lucky for me, there seems to be no shortage of either. If you didn’t know I was a foodie, a peek into my freezer would expose the embarrassing truth that I can’t commit to one brand or flavor with 3 tiny pints loitering with a few spoonfuls of each missing. 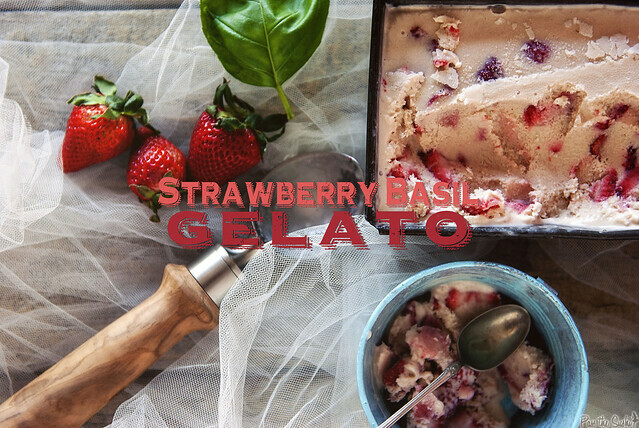 I am not one to make a giant sunday and swirl the flavors, I just dabble around with new ones all of the time. So between hunts for new ice cream parlors and trying the latest flavor from the market, I also have a fun scratch pad on the fridge where I have been jotting some new flavors I want to bring to reality. 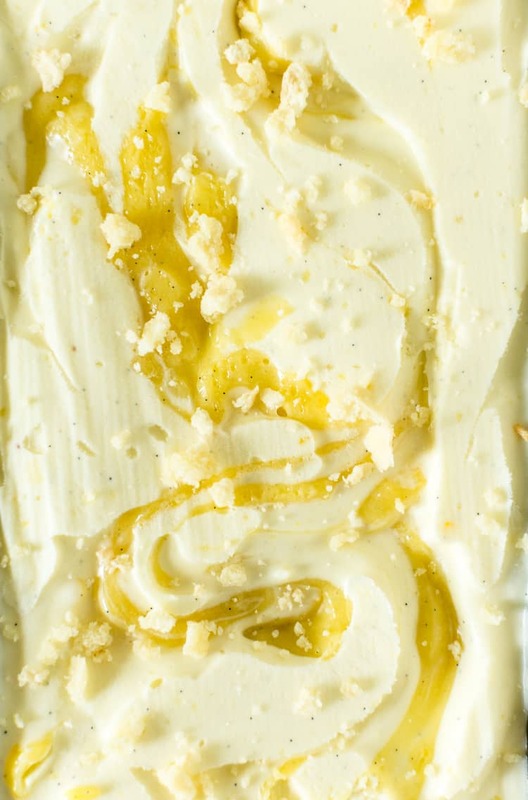 Starting with this Limoncello Gelato with Vanilla Lemon Curd Swirl. I knew I wanted to fold lemon curd into the creamy gelato, I just wasn’t sure how it was going to come out. And then I kicked things up by adding some limoncello and sprinkles of shortbread. 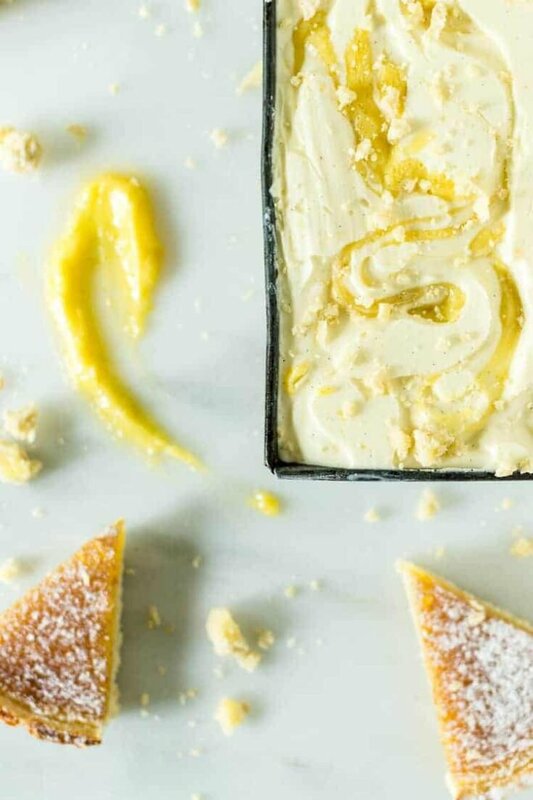 I don’t consider myself a lemon kind of gal – but this one may be on repeat a few more times this summer – it’s that kind of good. 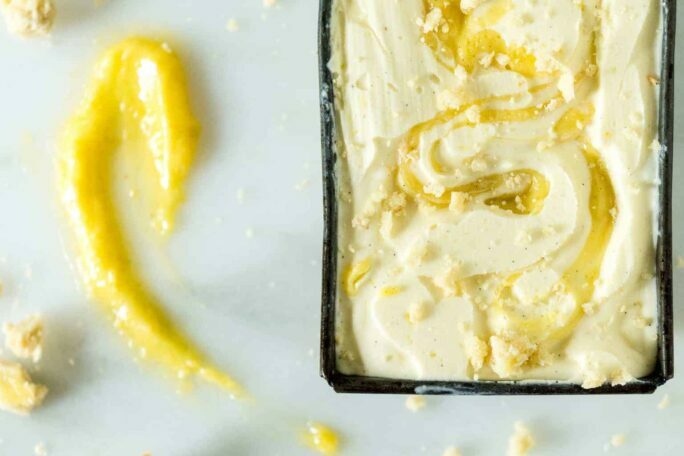 If you’ve tried my Limoncello Gelato with Vanilla Lemon Curd Swirl recipe or any other recipe on passthesushi.com please don’t forget to rate the recipe and let me know where you found it in the comments below, I love hearing from you! You can also follow along for more good eats and travel tips on Instagram @passthesushi & @girlcarnivore, Twitter & Facebook. In a large bowl, whisk the egg yolks and sugar until pale and smooth. In a large saucepan, heat the milk and cream over medium heat until the edges just start to have bubbles around them and steam is rising from the surface. In a slow steady drizzle, whisk the hot milk into the egg mixture. Pour back into the saucepan and return to medium heat, stirring, and cook until the mixture has thickened a bit coats the back of a spoon (about 170 degrees). Transfer to a bowl placed in an ice bath and stir in the limoncello. Allow to cool before covering to cool completely in the fridge for 4 to 6 hours. When ready to make the ice cream, read over the manufacturers instructions for your ice cream maker (I keep my attachment in my big freezer at all times - always prepared for ice cream). Churn the egg base and just before until set. Spoon half into an airtight container. 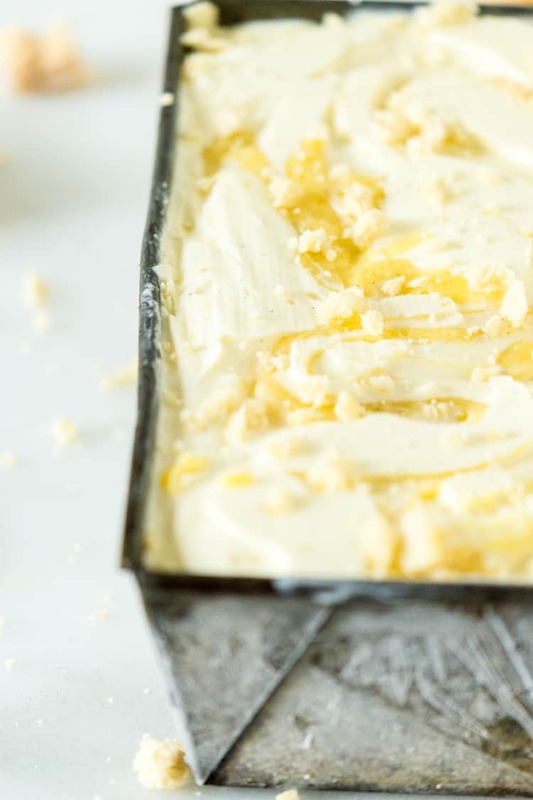 Place several dollops of the lemon curd on the gelato and swirl with a knife. Sprinkle with half the shortbread cookies. Repeat with the remaining gelato, lemon curd, and shortbread. When done, seal the container and let freeze over night.